Journalist, broadcaster, television personality, gourmet, author and self-proclaimed Domestic Goddess, Nigella Lawson is one most recognisable faces in the food business today – and has been so for twenty years. Known for her cooking, her books and the accompanying television series, Nigella published How to Eat in 1998, selling near to a third of a million copies. The Sunday Times called it ‘the most valuable culinary guide published this decade’. Her second book How to Become a Domestic Goddess won her the British Book of the Year award in 2000, fending off the competition from J K Rowling. 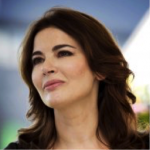 After graduating from Oxford with a degree in medieval and modern languages Nigella began her career as a book reviewer and as a restaurant critic. She was Deputy Literary Editor of the Sunday Times by the age of 26. She then turned her skills to freelance journalism writing food and lifestyle columns for Vogue and The Times Magazine. More than a decade later her books have gone on to become international best sellers and have created numerous TV cookery shows. One of the latest aired in 2017 on BBC2 as a Christmas Special. As a television personality Nigella has phenomenal and lasting international appeal and has been judge and mentor on the UK and US series of reality cooking show The Taste. In 2016 Nigella was a guest judge on MasterChef Australia. In 2014 the Observer Food Monthly Awards voted her Best Food Personality and in 2016 Fortnum and Mason awarded her TV Personality of the Year. As a speaker Nigela Lawson is not limited to just her writing, cooking and television work as she’s also an very successful businesswoman. She owns her own cookware range that has been estimated to be worth in excess £7 million. And that’s in addition to selling 3 million cookery books worldwide! Oh, and we’re told that she’s also the undisputed queen of the food-based double entendre.